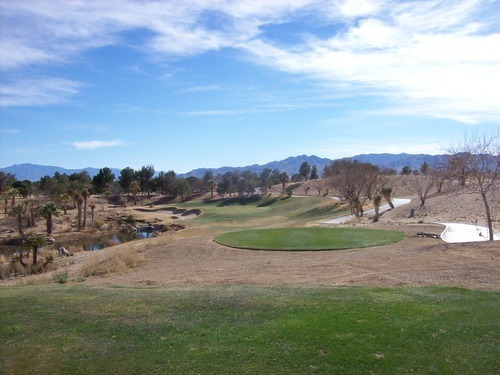 By the time I finished at Laughlin Ranch, the sun was out and shining and it was a beautiful afternoon. 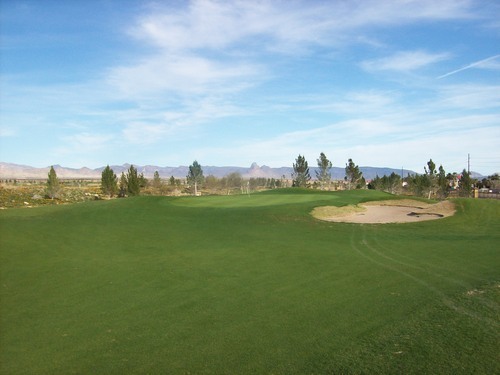 I actually checked with their pro shop to see about playing the front nine again, primarily to get some better pictures on that side with the sun out over the mountains. But they were still pretty busy, so I hit the road. 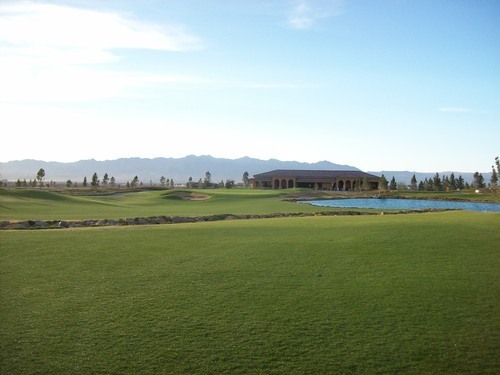 I knew Los Lagos was managed by the same company that runs Laughlin Ranch, so I figured it was at least worth driving by to scope out while in town. 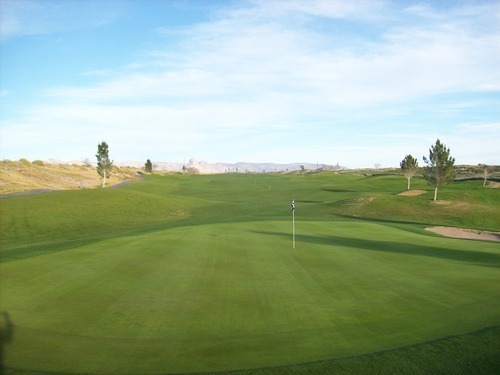 I headed down there and as I pulled up to the course, I could see it was looking pretty green and I didn’t see anyone on the holes I passed by on the way to the clubhouse. There were only a handful of cars in the parking lot, as well, so I knew it was probably open for a quick round. I checked in with the pro shop. The price was $55 with a cart, which seemed a little steep for a late twilight round. But I was there and ready to go, so I didn’t think twice about it. I didn’t run into a soul while out on the course. When I was making the turn, I did notice a couple groups finishing up on holes 17 and 18, but nobody was directly ahead of me all day so I zipped right through. 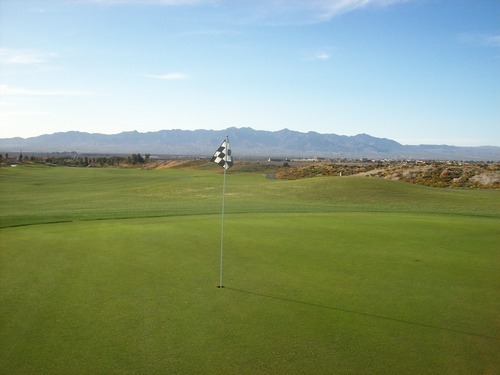 It was great and the weather was absolutely perfect, though some wind kicked up a little bit as the round went on. The course itself was a pleasant surprise because it offered something different than anywhere else I played over the weekend. I didn’t really know anything about it going in, but I quickly learned this was the course I should have played in the morning instead of the much less desirable Huukan just up the road. 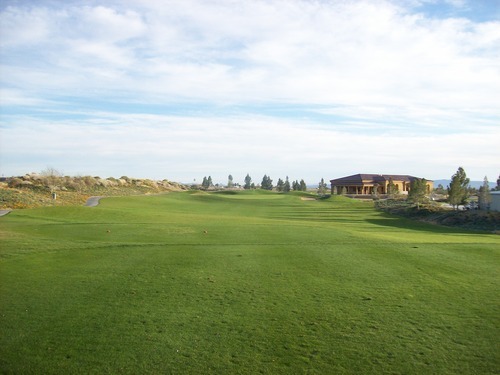 Los Lagos features a solid links style design. It’s remarkably simplistic and subtle in its architecture considering it was supposedly designed by Ted Robinson, Sr. Simplicity and subtlety are usually not qualities his courses are known for. 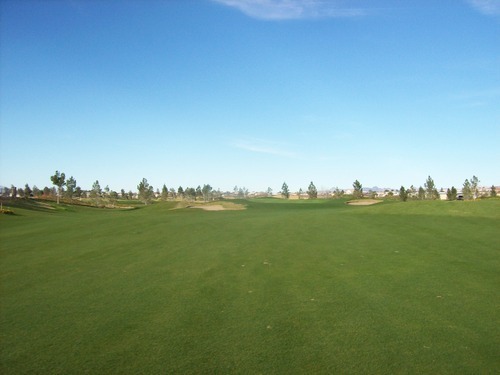 The fairways are wide and the greens don’t feature too much undulation, so it’s not overly challenging. The biggest component of challenge here is definitely dependent on how hard the wind is blowing. 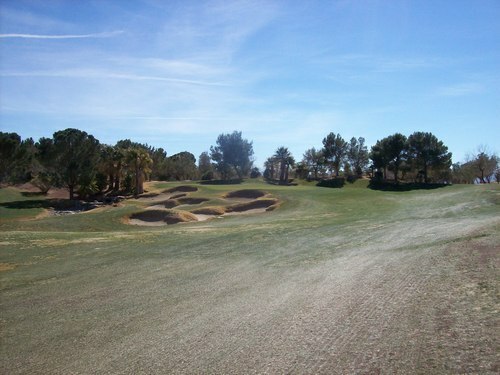 In tamer conditions, it’s a relatively benign course where a good score can easily be posted. 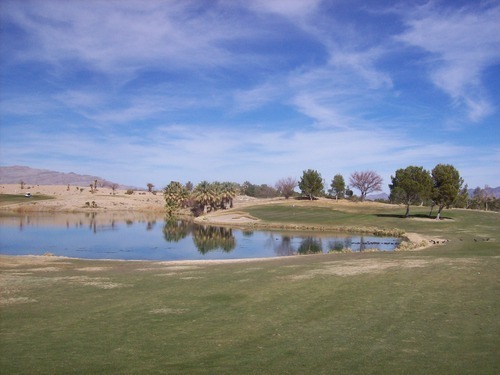 Aesthetically, Los Lagos has some good and bad qualities. 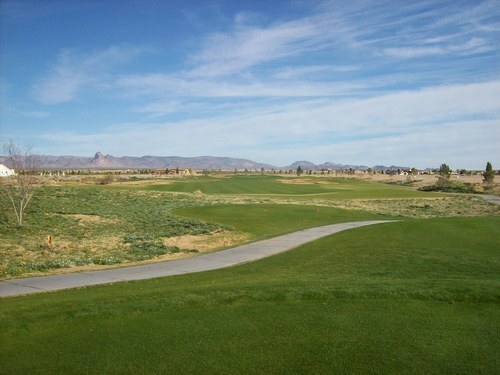 The course is a centerpiece to a neighborhood, which still appears to be in the early stages of development. I’m not sure if it’s relatively new or one that kind of petered out during the housing downturn. There are a few scattered houses around the course and plenty of surrounding land that looks to be graded for new construction. It doesn’t look too great at this point. However, the lack of houses does open up some nice views of the surrounding mountains in the distance. Once more houses go up, it will definitely feel more enclosed. Also, the course itself has some nice aesthetic touches. On the outer edges of many holes that might normally just be deep native grasses on a traditional links course, there are some nice orange flowers mixed in for a pleasant look. There are a few notable holes here like the 18th, which is a strong finisher, and everything about the design is solid overall. Yet, nothing that really jumped out at me. The only hole that stuck in my craw was the par-5 5th and that’s for the reason that I didn’t really care for it. On paper, it’s a pretty straightforward par-5 design, but what you can’t see from the tee box is the big water hazard bisecting the fairway. 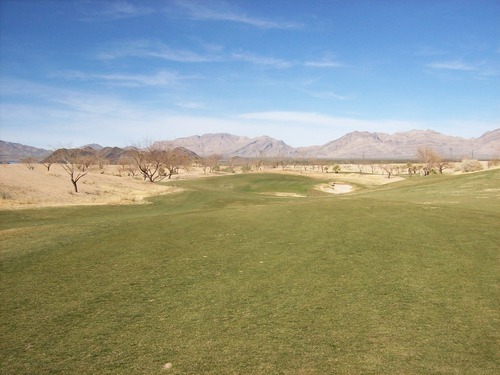 From the blue tees, the hole plays at over 550 yards and from the whites it’s over 530, so with that kind of length it is one most people would like to hit driver on. 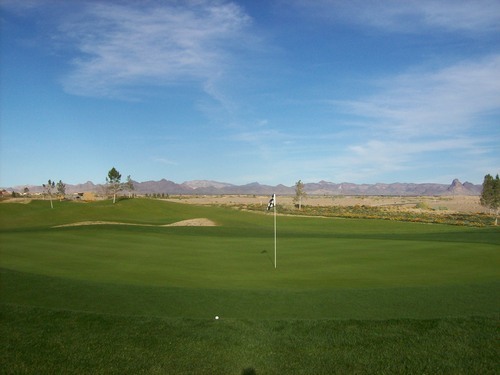 However, I would recommend leaving it in the bag unless you can really crush the ball (I would estimate about a 280-yard carry to clear the water from the whites and 300+ from the blues). I didn’t know better and whacked a really good drive, only to get up and see that my ball was nowhere to be found except at the bottom of the pond. 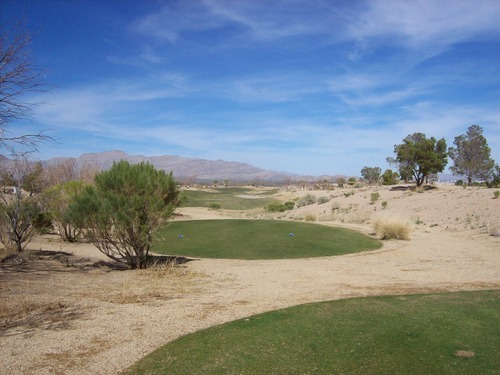 Your best bet here is to lay back and just play it as a three-shot hole. 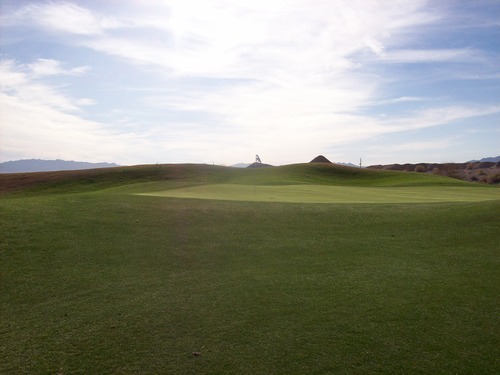 It kind of takes the fun out of a par-5 and the overall design seems flawed, but it is what it is and you’ll want to play it smart. Beyond that, you can be plenty aggressive throughout the rest of the course, so fire away and have fun. 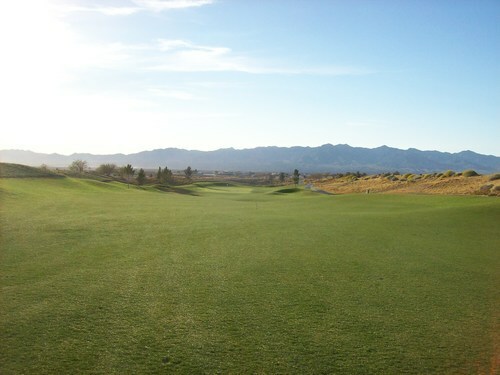 The course was in really nice shape, as well, which definitely added to my experience. 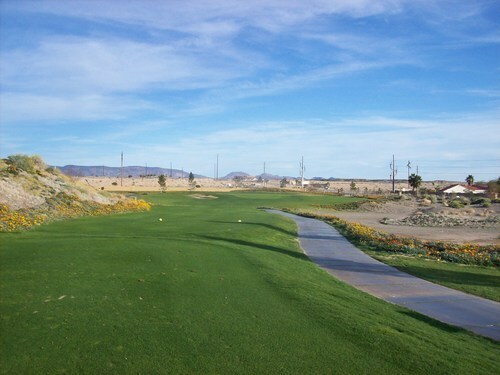 There were good tee boxes, excellent fairways and great greens. 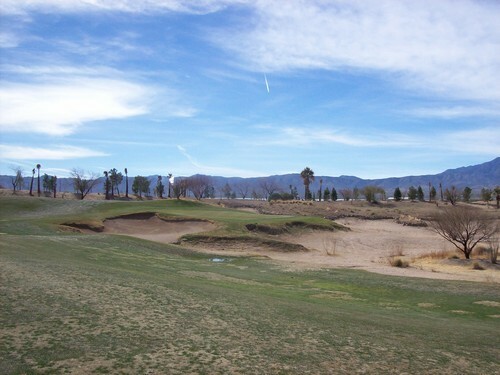 The sand traps were good, as well. 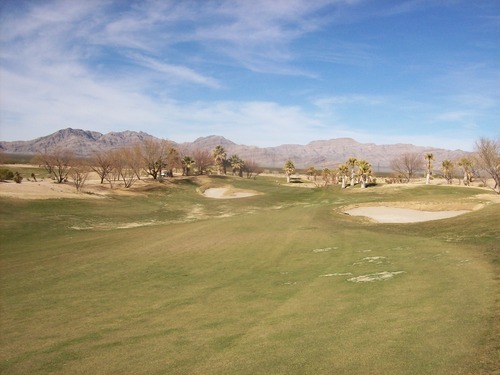 Around the fairways, the rough had kind of a semi-dormant look with a mix of brown and green. It was cut low and not much of a factor. Around the greens, however, it was thick, green and lush, so recovery shots were tough. Overall, I had an enjoyable experience at Los Lagos. 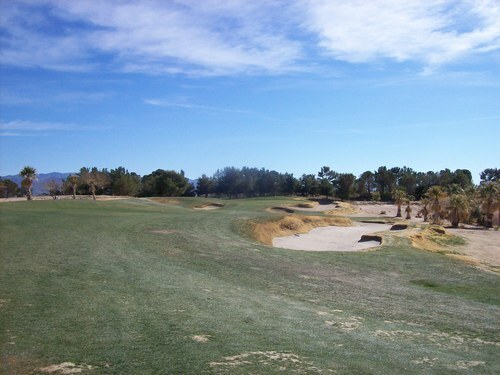 Of the courses I played over the weekend, it would rank a solid third. 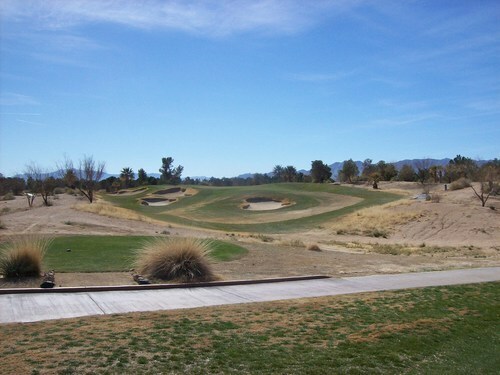 It was probably in the best condition of all of them, but the layout falls a little short compared to more dramatic designs like Mojave Resort and Laughlin Ranch. It really wasn’t that big a detour. It took about and hour and 15 minutes to drive over toward Primm on some desolate desert highways and the drive home from Primm is much shorter than from Laughlin, so it wasn’t too bad overall. Luckily, the holiday traffic heading home wasn’t nearly as terrible as I feared, so it worked out well. 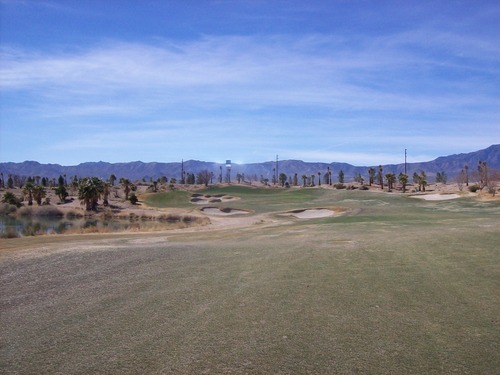 The main reason for this detour was because this was the LAST course on my public, regulation 18-hole list for Southern California. 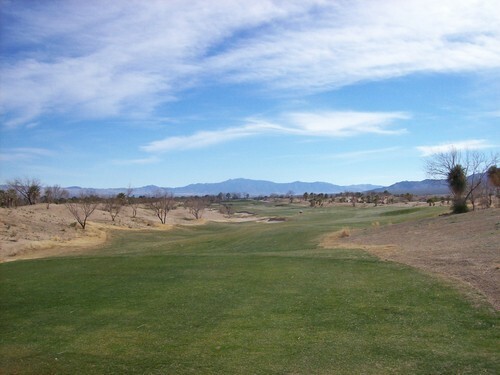 There are a few courses on the “fringe” that you might categorize as semi-private because they do offer limited public play opportunities, but as far as true “public” regulation courses that I can walk up and play any day of the week, I believe I’ve gotten them all. 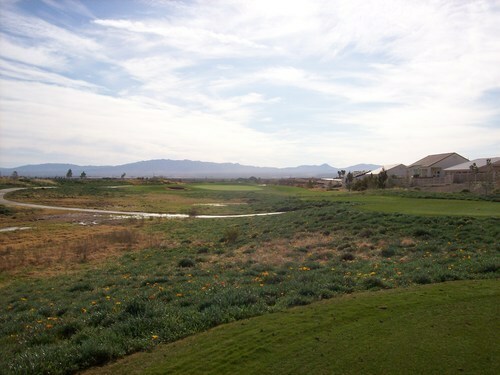 Though Primm Valley is generally associated with the Nevada border town of Primm, it is technically located in California. 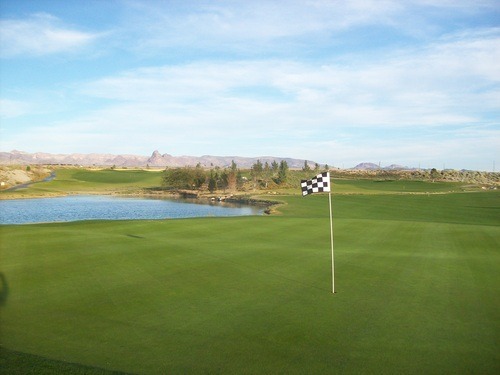 I had the opportunity to play the Lakes course there last November and I loved it. 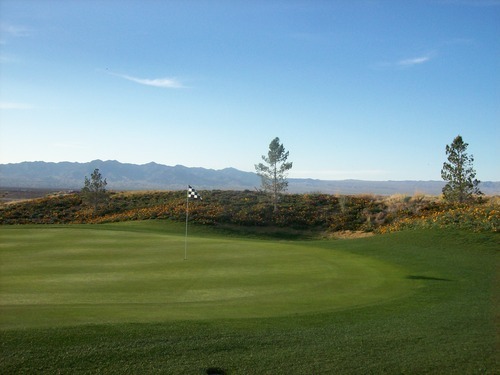 And though I knew the Desert course was not supposed to be quite as nice, I was still looking forward to this visit. I figured it was a good enough course to serve as the finale of my weekend trip—and of my SoCal goal that I’ve been obsessively working to complete in the last few years. 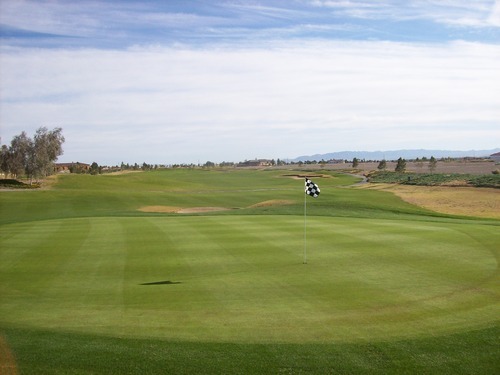 I was watching prices the last couple of weeks and they started pretty high (near $100), so when I saw them drop to $79 on GolfNow I went ahead and booked the 9:50 time, which is the first time off in the morning (more on that later). They charged me $80 at the course (?) and after what turned out to be a disappointing round, I wasn’t feeling too good about that price. What added insult to injury was the fact that the guys I played with told me after the round they only paid $30. I guess I got screwed for booking early! Now, usually I am on the other side of the coin with some of the last-minute booking deals I get, so I can’t feel too bad about it. You win some and you lose some, but I really felt like I lost at Primm Valley. Normally, I wouldn’t start with conditions, but that was a big part of the story here. The course was not really in good shape. Everything was thin, dry and patchy. 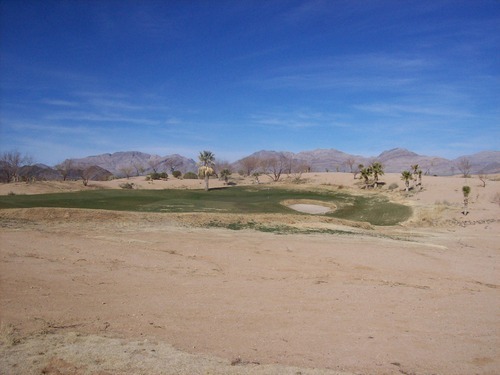 It was not very nice looking and there were a lot of tight lies to contend with. It was not completely terrible for play and the extra run-out did help at times, but it was still disappointing (especially at the price I paid). 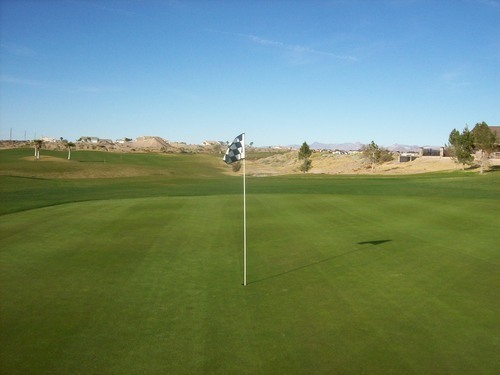 The greens were receptive, but bumpy and rolling at medium-slow speeds. The bunkers were fine. In other words, it was playable but visually disappointing and you’ll see in the pictures how unimpressive it looks in this state. The good news it’s not hard to envision how great this course would (will) be when it’s in nicer shape. I was in the first group out on the 10th tee at 9:50. They build in a late start here during the winter to ensure there’s no frost delay to contend with. I don’t have a problem with courses doing this, but you can argue whether it’s better to do a 1st/10th start or a shotgun style. We moved around our first nine (the back nine) pretty quickly and then ran into the groups at our turn. The overall pace still wasn’t too bad at about 4:15. 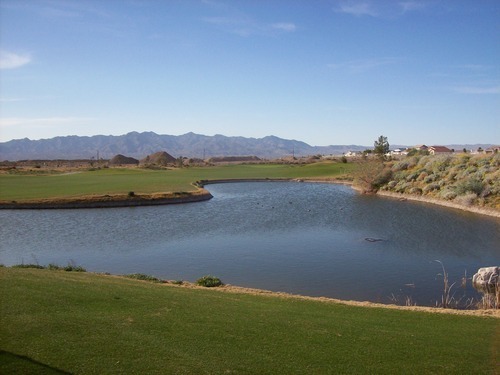 On a positive note, the layout of the Desert course at Primm Valley is just about as strong as the one on the Lakes course. Both were done by Tom Fazio and have a lot of similarities. 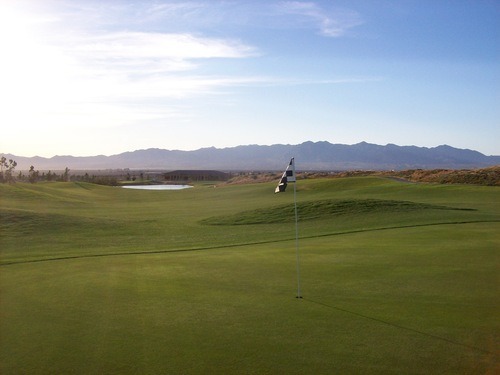 Plenty of twists and turns, elevated greens and intimidating bunkering throughout. 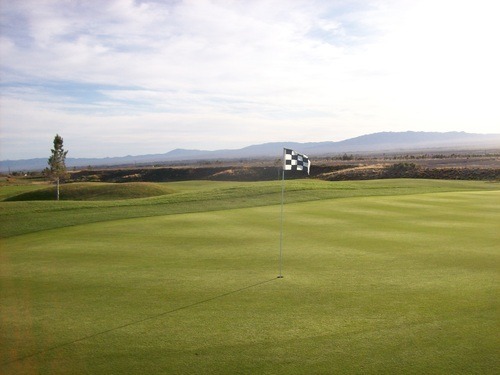 It’s a course that makes you work for a good score, but if you hit your spots it does offer opportunities. It’s a very fair design for the most part and it’s as challenging as you want to make it depending on which tees you play. The whites are just over 6,000 yards, the blues are over 6,500 and the blacks top out at over 7,100 and offer all the challenge you want. 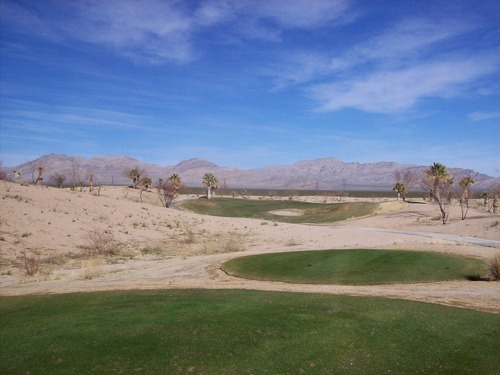 The main difference between the Lakes and Desert courses a Primm Valley is the trees. 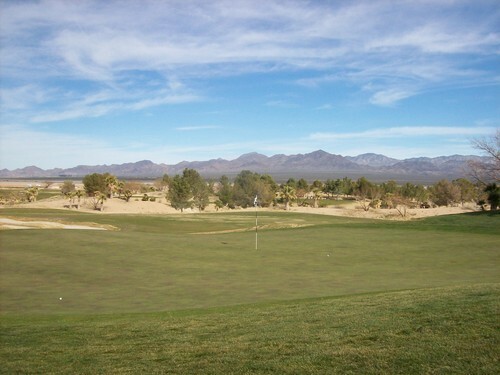 The Lakes has a unique look surrounded by plentiful desert pines for a more enclosed look and feel. 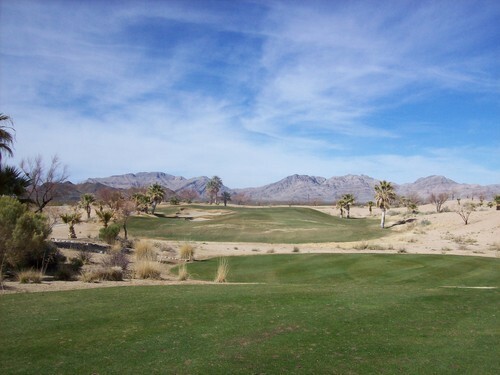 The Desert, as the name would suggest, is a more wide open desert style with very few trees (more palms than pines) and a more exposed feel with the expansive desert landscape all around you. 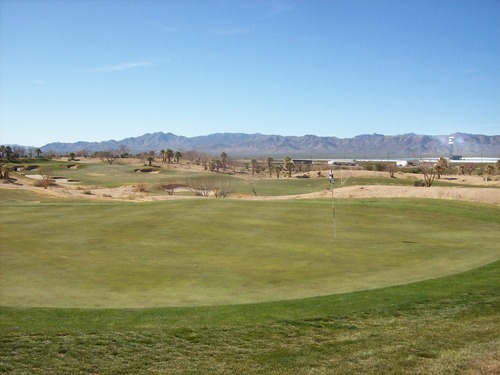 Of course, the big solar power plant wasn’t there when they built this course, but now that comes into view a lot on the Desert course. 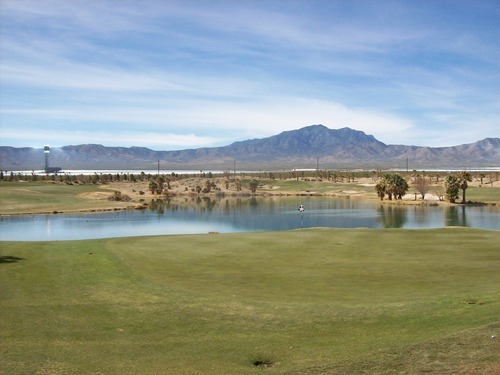 I don’t think the layout feels as “pretty” as Lakes, but it does offer some better views of the surrounding mountains and desert without so many trees. Every hole here offers something a little different. There are long, brutal holes and shorter target holes that entice you to be aggressive. There’s a nice mix of par-3s with the most notable one being the 9th hole that features a slightly downhill tee shot with a water hazard in play short and left. The par-4 that stood out to me was the 2nd, which is a beast with water in play from tee to green. The fairway landing area feels very narrow while standing on the tee (there’s a little more room out there than you think as long as you avoid the bunkers). 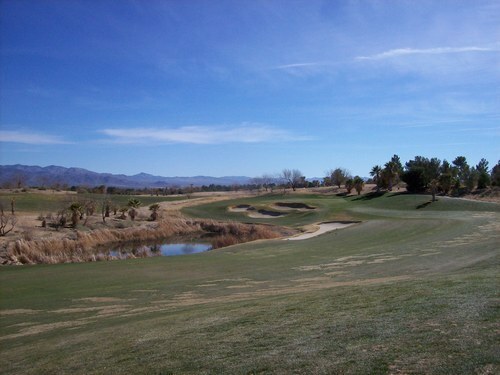 Then the hole doglegs sharply to the left for an intimidating approach directly over the water. Naturally, the safer you play it off the tee, the longer your approach. It’s a fun design that I’d like to play a few times to figure out the best strategy. 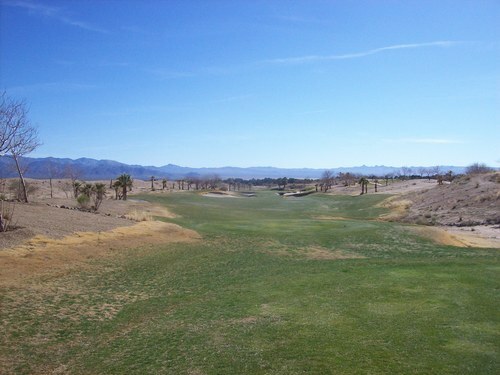 So on the positive side, I really liked the layout and setting of the Primm Valley Desert course. If in nice shape, I’d gladly play it again for what I paid. However, at that price and with the conditions I got on Monday, it was definitely a major let-down. So I would recommend avoiding this course in winter, and from what I hear, in summer as well. Hit those nice spring and fall windows and enjoy. 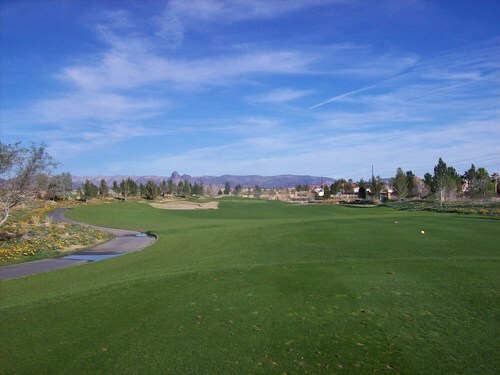 Either way, I would play Lakes first as it’s definitely the better course of the two and generally kept in nicer shape.